Water is also required to meet personal and household needs, for energy and industrial production, and to maintain important water-dependent ecosystems and ecosystem services. With demand and competition for water on the rise, however, the planet’s water resources are under increasing stress due to climate change, poor management and pollution. Agriculture holds the key to successfully achieving the objectives and aspirations articulated in the Sustainable Development Goals and the Paris Agreement on climate change. It is also crucial to the livelihoods of hundreds of millions of smallholder farmers and rural communities worldwide. Farmers must be at the centre of any process of change in agriculture. Through appropriate policies that provide incentives and ensure effective governance, farmers can be empowered to conserve biodiversity, protect ecosystems and minimize environmental impacts. Irrigation institutions must respond to the needs of farmers. 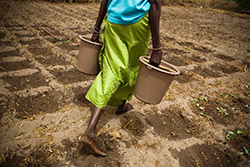 Ensuring the reliable delivery of sufficient water, increasing the transparency of irrigation management, and achieving efficiency and equity in access to water is likely to require changes in attitudes in institutions and among farmers, as well as targeted investments in infrastructure modernization, institutional restructuring, and the upgrading of the technical capacities of farmers and water managers. Countries have identified agriculture as a major sector of intervention in their nationally determined contributions to the mitigation of climate change, and many have placed water at the top of the list for envisaged adaptation measures. Shaped by these new challenges, FAO’s water programme is responding decisively to the needs of its member countries. This World Water Day, 22nd March, is about tackling the water crisis by addressing the reasons why so many people are being left behind. Get familiar with the issues – why are people being left behind without safe water and what can be done to reach them?